Camille Pissarro, Setting Sun and Fog, Éragny (1891), oil on canvas, 54 x 65 cm, Private collection. WikiArt. After three centuries in which European art had concentrated on showing full details of landscapes, it was the innovative paintings of JMW Turner and Caspar David Friedrich which had started to popularise fog effects. This was siezed upon by the Impressionists, so that, by the late nineteenth century, fog was quite a common feature of landscape paintings. 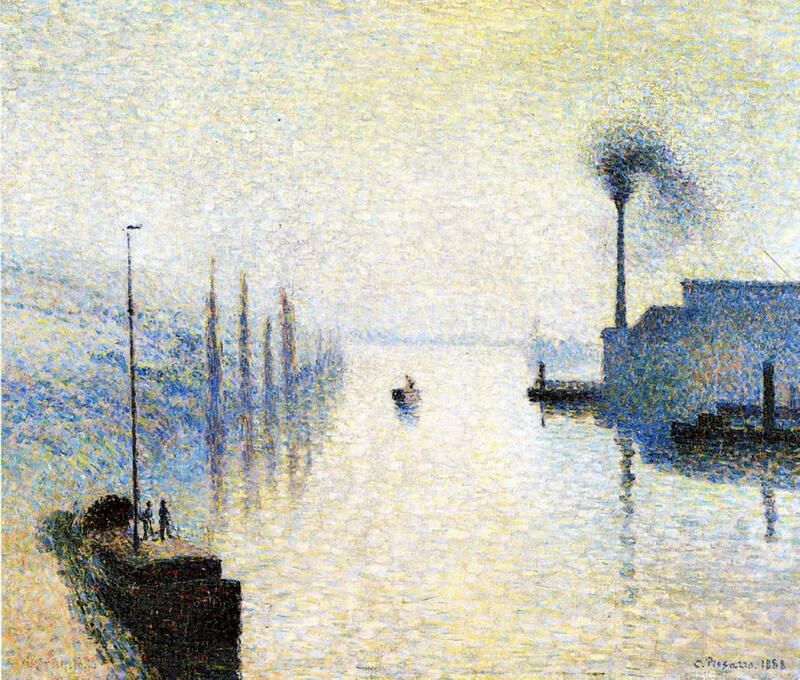 Île Lacruix Rouen, Effect of Fog from 1888 is one of Pissarro’s best-known Divisionist (‘pointillist’) paintings, and one of several to use fog to great effect. To that, Pissarro adds black smoke curling idly out of the chimney. 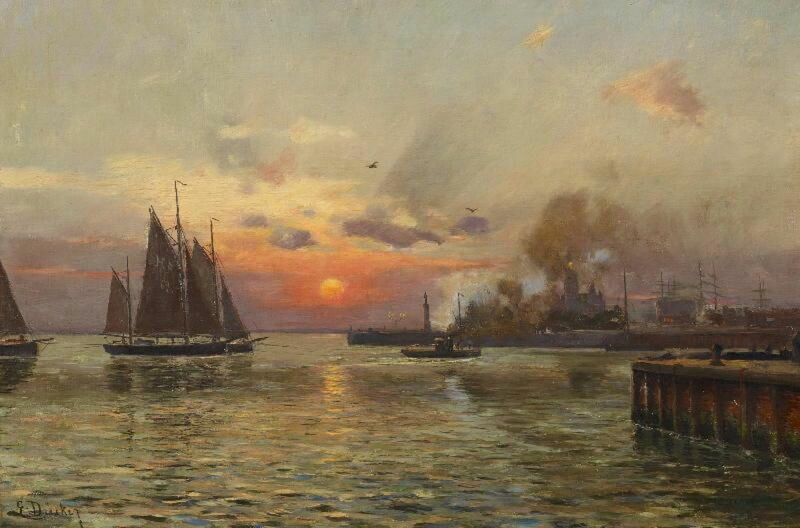 Eugen Dücker (1841–1916), Morning Fog at a Port at Saint Petersburg (c 1890), further details not known. Wikimedia Commons. Eugen Dücker’s Morning Fog at a Port at Saint Petersburg from about 1890 is reminiscent of Turner’s early Sun rising through Vapour in that it keeps the fog distant behind abundant foreground detail. It adds the acrid brown smoke rising from a small vessel making its way into harbour, which provides colour contrast against the dawn sky. Claude Monet (1840–1926), Grainstack, Sun in the Mist (1891), oil on canvas, 60 x 100.3 cm, Minneapolis Institute of Art, Minneapolis, MN. Wikimedia Commons. 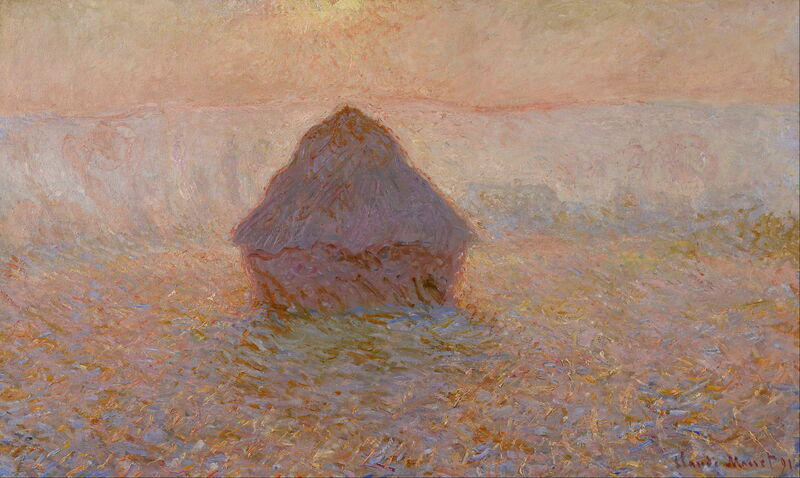 Fog effects had become part of Claude Monet’s repertoire when painting series works, here Grainstack, Sun in the Mist (1891) from his famous series showing grainstacks which he painted near his house at Giverny, near Paris. 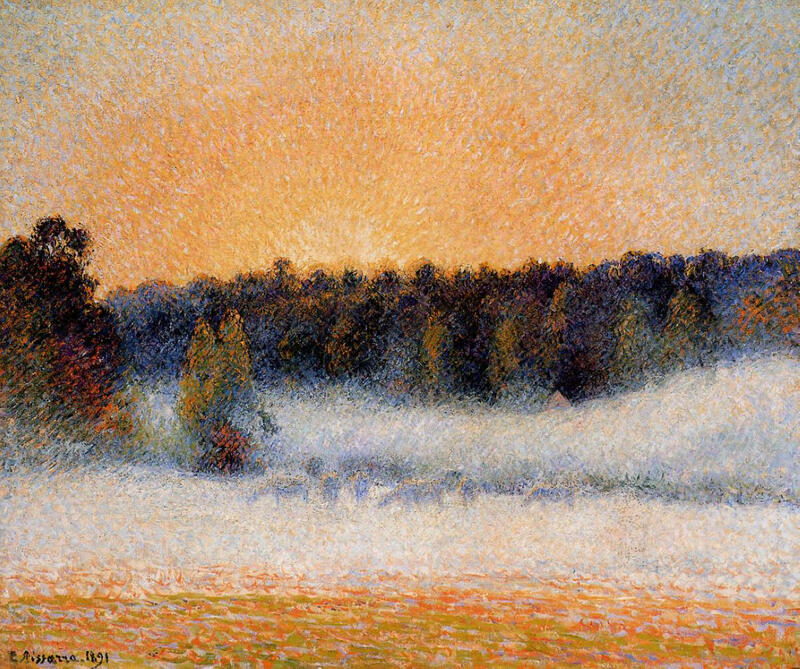 In the same year (1891), before he returned to mainstream Impressionism, Pissarro painted this bank of dense fog at the edge of a wood, in his Setting Sun and Fog, Éragny. The play of the fog on the cattle here is a good example of how objects viewed through fog can be transformed to look unfamiliar, mysterious, even ghostly. Pierre-Georges Jeanniot (1848–1934), Night on the Seine (1892), further details not known. Wikimedia Commons. Pierre-Georges Jeanniot is now almost forgotten. 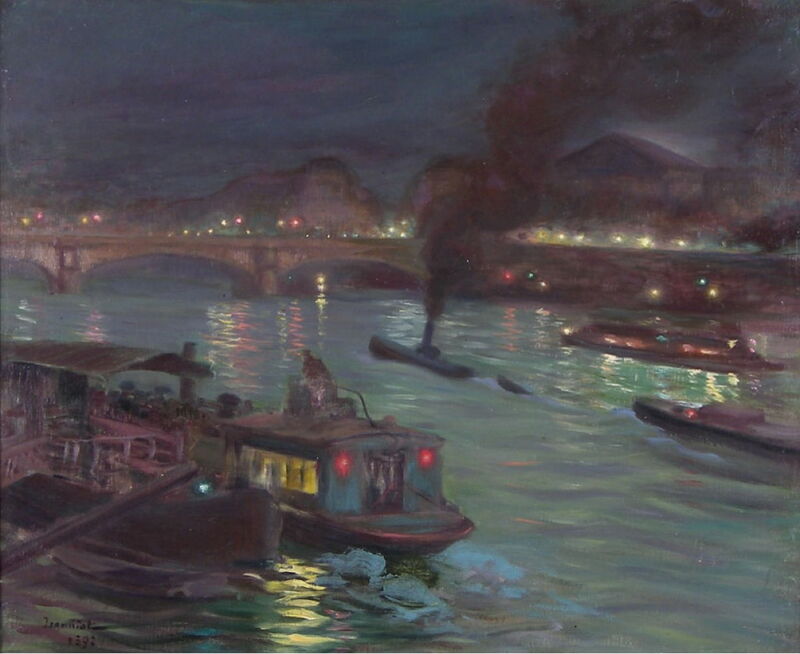 His painting of Night on the Seine of 1892 is unusual, being a nocturne with its distinctive effects on what can be seen, further modulated by fog. It shows the river running through central Paris on a slightly foggy night, and plays skilfully with effects on lights, and their reflections, as well as being thoroughly painterly. Jeanniot also shows the contrasting opacity of smoke. Claude Monet (1840–1926), The Houses of Parliament, Sunlight Effect (1903), oil on canvas, 81.3 × 92.1 cm, Brooklyn Museum, New York, NY. Wikimedia Commons. 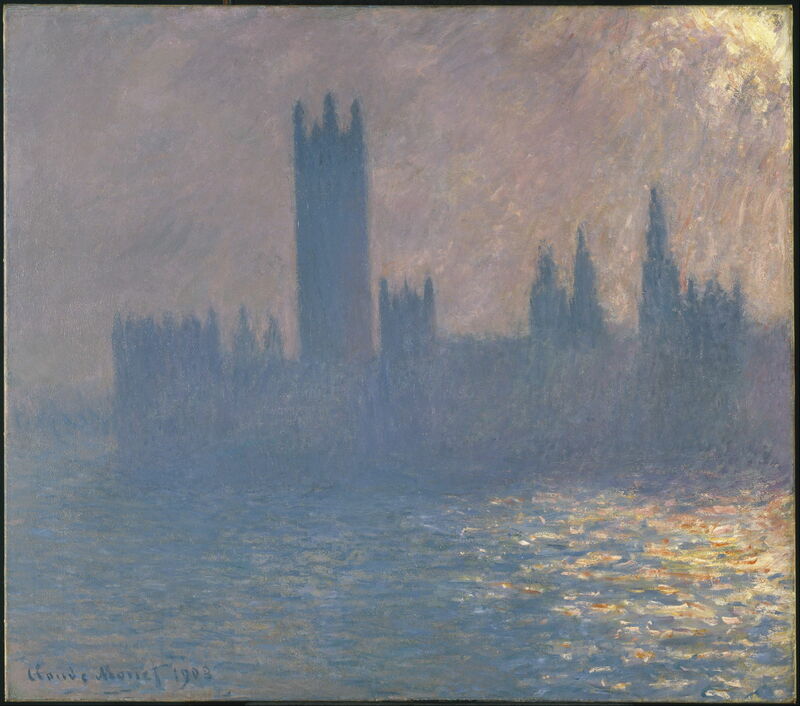 When Monet returned to London in 1899, and in the following two years, he chose to paint a series of 19 works which examine different atmospheric effects on the same view of the Palace of Westminster. These were all started from the second floor of the Administrative Block at the northern end of the old Saint Thomas’s Hospital on the ‘south’ bank of the River Thames, and completed over the following three or four years. His The Houses of Parliament, Sunlight Effect (1903) is even more radical than his painting of thirty years before, showing little more than the Palace in silhouette, the sun low in the sky, and its broken reflections in the water. Claude Monet (1840–1926, Waterloo Bridge. Effect of Fog (1903), oil on canvas, 65.3 x 101 cm, Hermitage Museum Государственный Эрмитаж, Saint Petersburg, Russia. Wikimedia Commons. 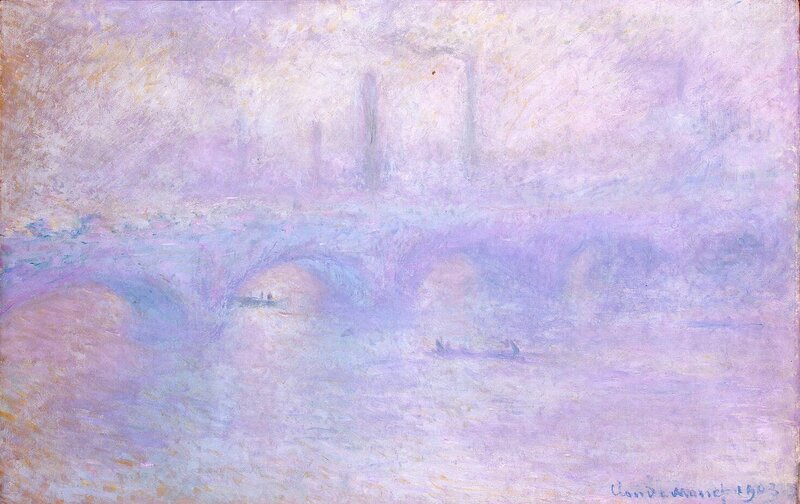 Monet’s Waterloo Bridge from 1903 is the ultimate conclusion of his paintings of fog, in which only the vaguest of forms resolve in its pale purple and blue vagueness – and his common destination with the paintings of Turner over fifty years before. 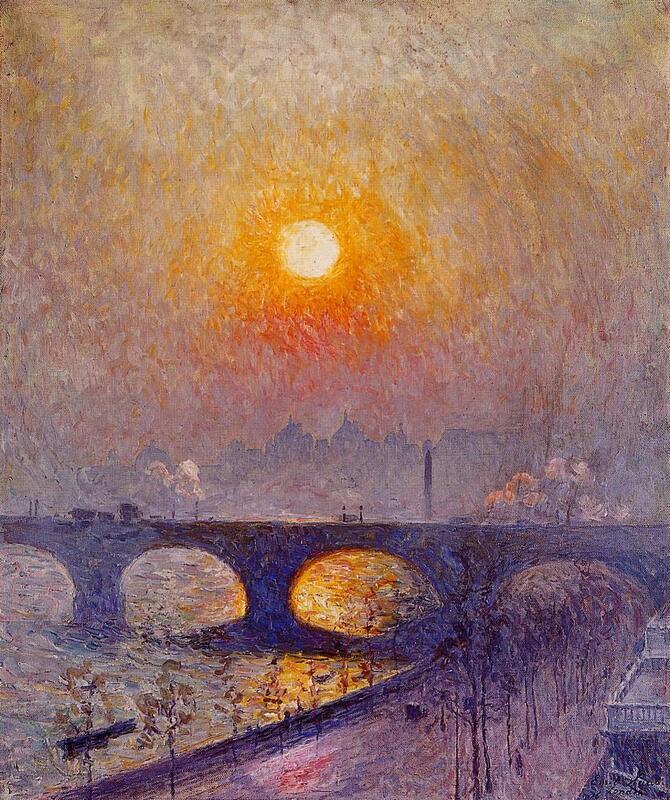 Others, like Émile Claus in his Sunset over Waterloo Bridge from 1916, were careful to retain as much form as they can. He uses billowing clouds of steam and smoke to great effect, and his inclusion of the road, trees and terraces in the foreground, on the Embankment, provides useful contrast with the crisp arches of the bridge, and the vaguer silhouettes in the distance. Ferdinand Hodler (1853–1918), View into Infinity III (1905), media and dimensions not known, Hamburger Kunsthalle, Hamburg, Germany. Image by anagoria, via Wikimedia Commons. 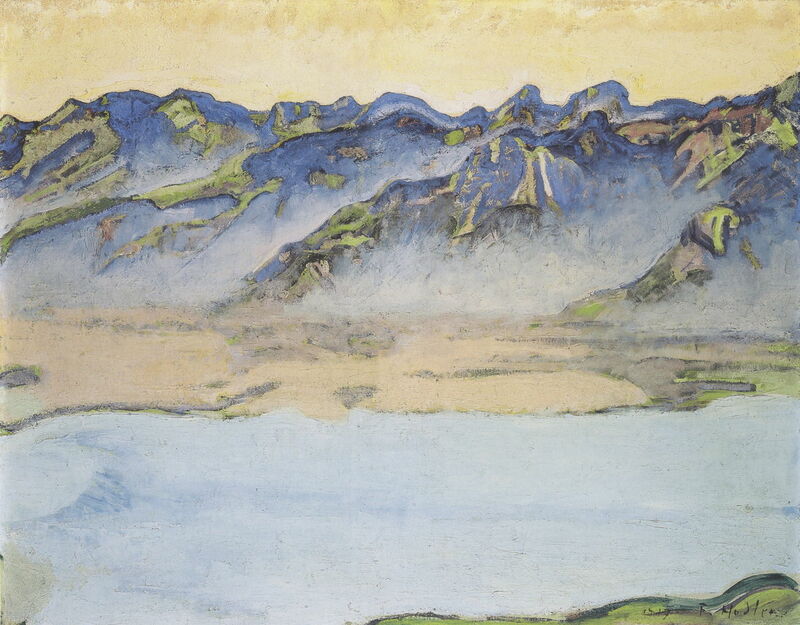 Ferdinand Hodler chose to develop from Caspar David Friedrich’s Wanderer above the Sea of Fog in his third version of View into Infinity from 1905. 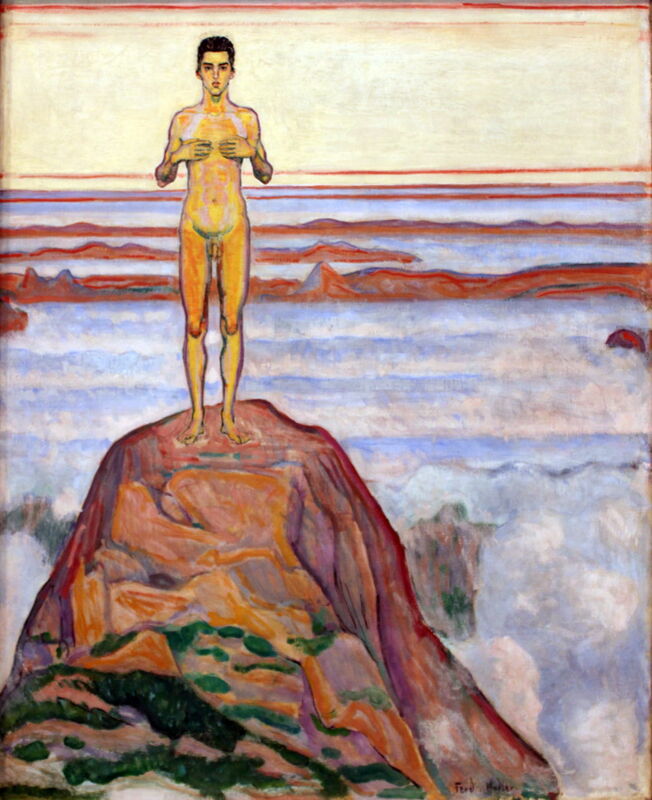 Standing on a rock pinnacle above Hodler’s sea of fog is a naked young man. Behind him long red mountain ridges pierce through the fog, and the pale lemon sky of dawn has parallel strips of red cloud. Ferdinand Hodler (1853–1918), Rising Fog Over the Savoy Alps (1917), oil on canvas, 68.5 x 88 cm, Musée d`art et d`histoire, Geneva, Switzerland. Wikimedia Commons. Easily mistaken for a watercolour, the optical effect in Hodler’s later Rising Fog Over the Savoy Alps, painted in the summer of 1917, heralds his change to extreme simplification, as the valley mist obliterates detail. Jakub Schikaneder (1855–1924), Riverbank with Tram (date not known), oil on canvas, 95 x 129 cm, location not known. Wikimedia Commons. 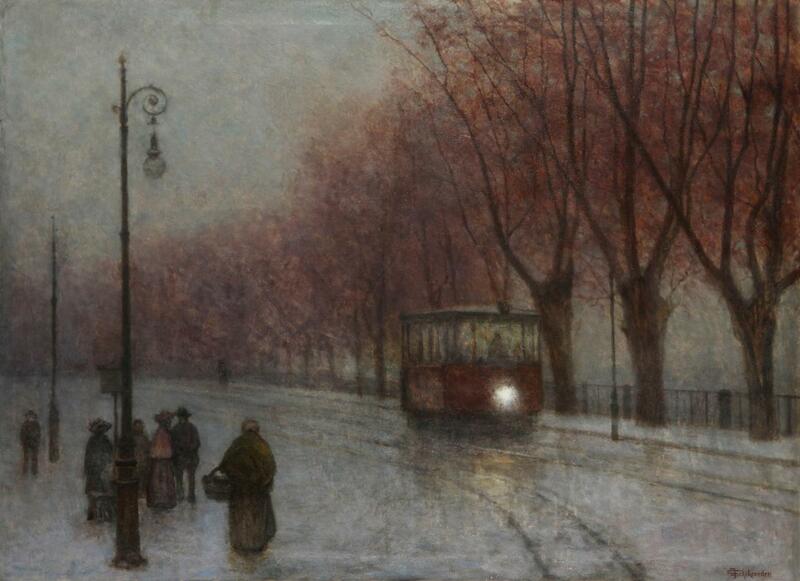 Jakub Schikaneder’s undated Riverbank with Tram shows a tram travelling, most probably in Prague, during a damp and foggy autumn evening. After the First World War, realist landscape artists such as George Clausen continued to use the optical effects of fog in their paintings. 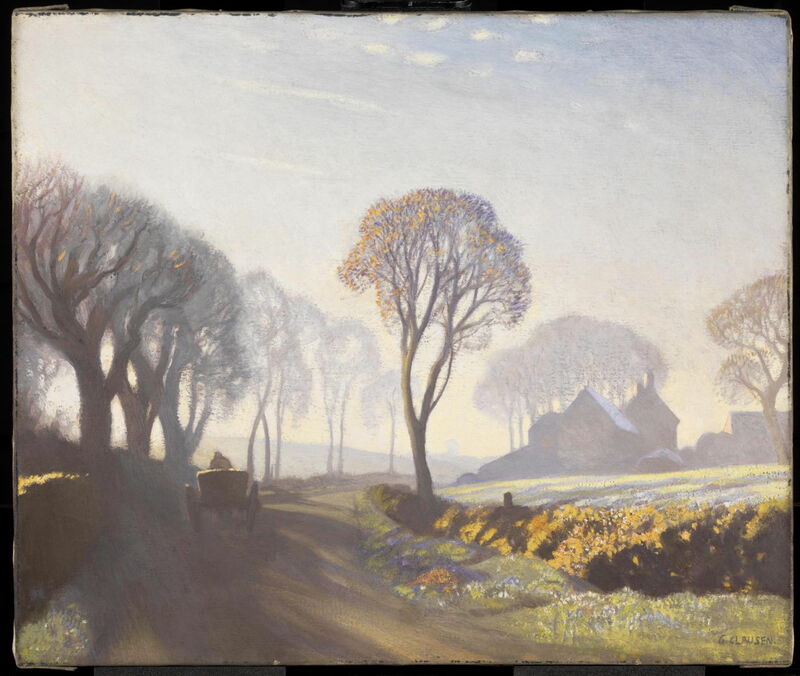 The Road, Winter Morning from 1923 shows Barnard’s Farm at Duton Hill in the flatlands near Dunmow in Essex, England. Its mist and morning sunlight bring more subtle colour, a marked contrast to his earlier Impressionist paintings. Lesser Ury (1861–1931), London in Fog (1926), oil on canvas, 67 x 97 cm, location not known. Wikimedia Commons. 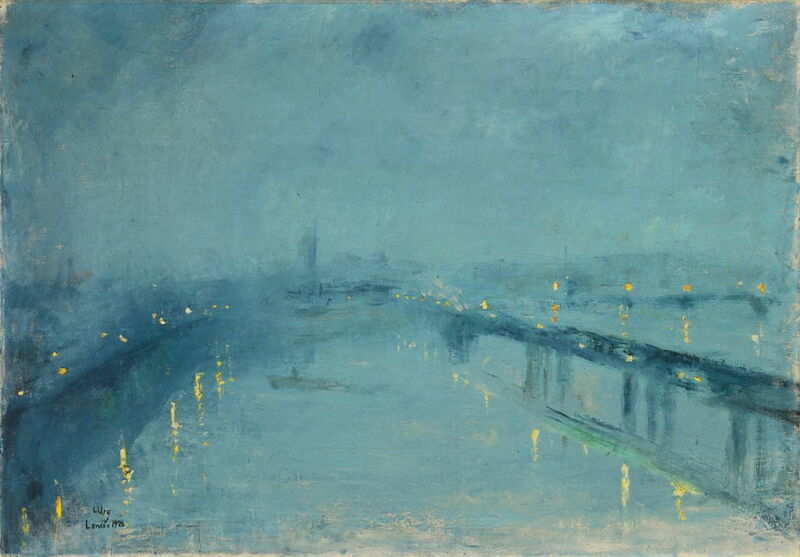 My last example is another view over the River Thames, this time by Lesser Ury. London in Fog from 1926 doesn’t appear to be a nocturne, but looks at the effects of fog on both lights and their reflections in a rather different way than Jeanniot’s painting above. I think that it’s safe to conclude that Western painting has accepted the many benefits of fog, just a few centuries later than Asian painting. Posted in General, Life, Painting and tagged Claus, Clausen, Dücker, Hodler, Jeanniot, landscape, Monet, painting, Pissarro, Schikaneder, Ury. Bookmark the permalink.